One of the biggest challenges that small business owners face is; what is the most effective way to take my big ideas and manifest them into reality? As a small business owner, I would often find myself stressed by the seemingly immense scope of the projects at hand and without a clear starting point or pathway to success. The result of these circumstances was a lot of frustration and very little productivity. About three years ago I decided to take a step back to focus on the true problem I was facing, I lacked a successful procedure on how to best execute my ideas and work in a way that would optimize my time while dramatically reducing my stress levels. Below I will outline the current methodology of strategic planning used by both myself and my team to drive Love2brew to achieve an average annual growth of 30% over the last six years as well found the non-profit OurSociety. Before we get into the details we should define what strategic planning is. Strategic planning is a method for taking your ideas (no matter how large or small) and breaking them down into several layers of organization, ending with a list of actionable tasks. Actionable being the key word here, because none of your planning matters if you do not have a clear path of action to complete it. At both Love2brew and OurSociety I spend a lot of my time mapping out the vision of what needs to be completed in order to best create focus for myself and my teams. A critical part of this is dedicating a consistent block of time to the planning process. The consistency within your daily routine will make it easier for you to develop the discipline to evaluate your business/personal projects from an objective level ensuring that your actions align with your vision. Strategic planning is also transparent; having your vision and plans broken down in front of you gives both you and your organization a very clear indicator about the status of projects and allows for more agility within your weekly schedule. Finally the most important part of strategic planning is creating actionable tasks which ensure that everything that takes place in the planning process directly translates into a specific action. When that action is complete it can be “checked off” or removed from your list. This type of action based approach will allow you to accomplish massive goals by breaking them down into minute tasks that can be done whenever the time allows. Business owner or not, many of us understand how detrimental stress can be in the face of productivity; strategic planning offers a solution to managing projects and the subsequent stress that often follows behind them. By taking the time to break down your ideas into manageable tasks it enables you to spend significantly more time working towards the completion of the goal and less time trying to establish what to do or where to start. So if we understand what strategic planning is the next question we need to answer is why should we plan? First and foremost strategic planning is a tangible way to visualize your success. Visualizing your success has been spoken about ad nauseam from thousands of successful people in all walks of life and that is because it is true and it works. When you have outlined your vision and a plan of action the mystique of the project is removed and replaced by a very clear and detailed path to accomplishing what you desire. As mentioned earlier stress reduction is a major benefit of strategic planning, I can only speak for myself but implementing strategic planning for my projects has been an incredible boon to my own mental health and daily attitude. If you want to take on big ideas and challenges it is necessary to keep your mental state in a positive place and avoid the pitfalls of poor decision making that come from over stress and fear of failure. Another important “Why?” of strategic planning is that it places a large focus on the growth of your organization. No matter what project you are undertaking, business or personal, growth is a quintessential part of success. Here we see a Project Tree in its natural habitat. Objective: At the top of your tree is your main objective that you are focused on accomplishing. It is an idea, a goal, a vision, a plan, or a purpose. Keep it to a few words or less. Be specific. Major Milestones: The next level of your tree focuses on every major milestone that will need to be accomplished before your goal is complete. Think of major milestones as a very broad but distinct category. For example, if I was starting a new business my Major Milestones would be “Product/Service”, “Marketing”, “Finance”, and “Company” and I would break everything else down into one of those four categories/milestones. 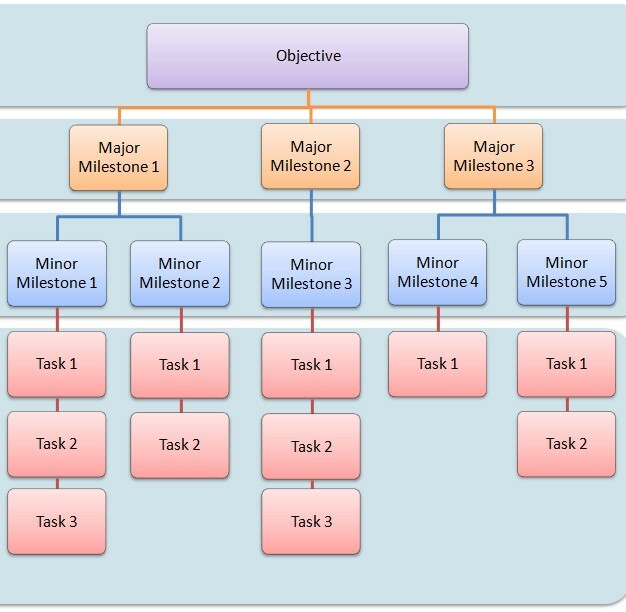 Minor Milestones: Depending on the complexity of your project you may assign another level of minor milestones or for smaller projects you may skip this level and go directly to the tasks. Minor milestones are categories similar to Major Milestones but more specific. For example, if I was starting a new business today I might breakdown my “Company” Major Milestone into the following Minor Milestones: “Website”, “Staff”, “Identity”, and “User Volunteers”. All of these are variable and depend on your overall objective. Tasks: Tasks are actionable items that can be distinctly measured and completed by doing something. The objective of setting these tasks is to clearly define what needs to be done in order to accomplish each Minor Milestone. Ideally you should be able to view your current tree and immediately know exactly what you need to focus your thoughts and engagement on. Tasks may also serve as a checklist of items to be crossed off when complete. Using our above example of Company > Website my tasks under website might be: “Purchase Domain”, “Wireframe”, “Outsource Design”, “Google Analytics”, “SEO Services”, “Setup WordPress”, etc. Notice how all of these tasks are one to two words, the objective is to concisely record what you need to accomplish, leaving room for interpretation once you begin your actual process. One thing that can be added to the task portion of the project trees is to include a time estimate in each of the Task boxes. I’ve found this method to be incredibly helpful in the event I find myself with an extra hour of time I can easily identify a task that will take an hour or less and focus on completing it. Creating a visual outline of your project tree can be a great benefit to you if having a physical checklist helps you manage your workflow better. 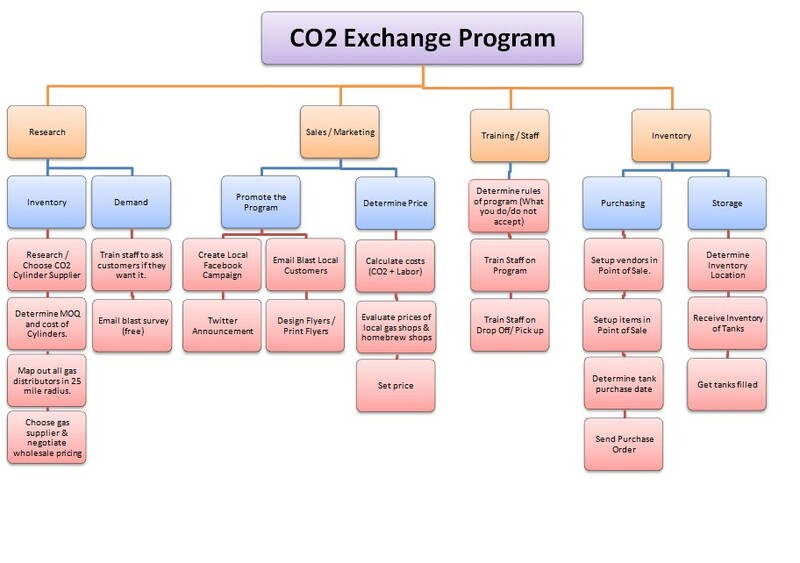 Project Tree for developing a CO2 Tank Exchange Program for Love2brew retail locations. Overall implementing strategic planning in your work or personal life will give you the tools to accomplish bigger and more complex projects in the most efficient and clear way possible. If after reading this it still seems complex my recommendation would be to start with something small, a minor project to get into the habit of planning. One of the biggest lessons I’ve learned from founding/operating my own business is that success is habitual. By taking continuous small steps to learn new methods of visualization and workflow management you will be able exponentially increase your output and strategic perspective on how to approach problems. These skills will compound upon each other freeing up significantly more time within your schedule to be spent on your vision and purpose and less on stressing about the tasks needed to accomplish the goal. If you have any questions regarding the method of strategic planning outlined above or have any feedback please feel free to reach me on twitter @ronrivers_.